Newmeasurements reveal Neptune's south pole is warmer than the rest of the planet,as expected. But it's still frigid. The polarregion's relative warmth could provide a route for methane gas to escape fromthe deep atmosphere, explaining mysterious hot spots that have been reportedthere, according to the study scientists. The first temperaturemaps of the blue planet's lower atmosphere, detailed in the journal Astronomyand Astrophysics, suggest temperatures at the south pole are elevated by about18 degrees Fahrenheit (10 degrees Celsius) compared with the rest of the planet,for which the average temperature is an icy -328 degrees F (-200 degrees C). ?Thetemperatures are so high that methane gas, which should be frozen out in theupper part of Neptune's atmosphere (the stratosphere), can leak out throughthis region,? said lead author Glenn Orton of the Jet PropulsionLaboratory in California. ?This solves a long-standing problem ofidentifying the source of Neptune's high stratospheric methaneabundances.? 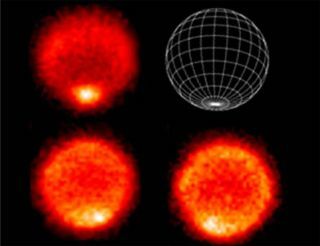 Orton andhis colleagues used ESO's VeryLarge Telescope to map the temperature variations. Locatedabout 30 times farther away from the sun than Earth is, Neptune receives about a tenth of apercent of the sunlight reaching our planet. Over time, however, the tiny bitof sunlight significantly affects Neptune's atmosphere. The warmerclimes detailed in the new report are consistent with the fact that Neptune'sSouthern Hemisphere, because of the planet's tilt and orbit, has been bathedfor about 40 years in the sparse sunrays that can reach the farthest planet inour solar system. A year on Neptune lasts about 165 Earth years, making summers last for 40 years rather than months.Now that the Southern Hemisphere's summer on Neptune is coming to a close,Orton and his colleagues predict that as the north pole turns sunward, anabundance of methane will leak out of that pole once it becomes warmer in about80 years. ?Neptune's south pole is currently tilted toward the sun, just like the Earth's south poleis tilted toward the sun during summer in the Southern Hemisphere,? Ortonsaid. ?But on Neptune the Antarctic summer lasts 40 years instead of a fewmonths, and a lot of solar energy input during that time can make bigtemperature differences between the regions in continual sunlight and thosewith day-night variations.? While not amajor constituent of Neptune's atmosphere, methane is responsible for theplanet's bluehue. When methane gas in the upper atmosphere absorbs red light from thesun, it reflects blue light back into space.